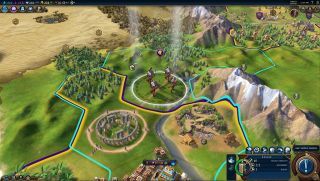 Civilization 6 is right around the bend, and if you're planning to try your hand at building an empire that can stand the test of time, you'll need to bring your wits and plenty of strategy. As for the hardware, well, there's nothing outlandish in the newly released minimum and recommended specs—a relatively modern setup will suffice. To start building a civilization, you'll need an Intel Core i3 processor clocked at 2.5GHz or AMD Phenom II CPU running at 2.6GHz (or faster), 4GB of RAM, at least 12GB of storage space, a 1GB Nvidia GeForce 450 or AMD 5570 graphics card from yesteryear, and a 64-bit flavor of Windows (Windows 7, Windows 8.1, or Windows 10). Publisher 2K Games kicks things up a notch for the recommended specs, though not by a ton. Those call for a fourth generation Core i5 CPU clocked at 2.5GHz or AMD FX8350 (or greater), 8GB of RAM, 12GB or more of storage, and an Nvidia 770 or AMD 7970 graphics card with 1GB of onboard memory. OS requirements are the same. "Thank you for your patience while we tested a variety of systems to ensure Civilization 6 is as optimized as it can be," 2K Games added. Civilization 6 releases to PC on October 21.